During an interview with The Atlantic last week, Donald Trump said that his daughter Ivanka would be an excellent Presidential candidate in the future and that she would basically be impossible for any rivals to beat. As scary as it has been to think about Donald Jr. becoming President, the thought of Ivanka becoming the Commander In Chief is even more horrifying, as Ring of Fire’s Farron Cousins explains. This past friday, the Atlantic posted an interview with President Donald Trump where he actually for a brief period talks about the future of the United States presidency and apparently that future in Donald’s vision includes yet another Trump as the commander in chief and that other Trump is not don jr this time. It’s actually Ivanka Trump told the paper if she ever wanted to run for president, I think she’d be very, very hard to beat. Uh, she’s a natural diplomat. She would have been great at the United Nations as an example. I even thought of Ivanka for the World Bank. She would have been great at that because she’s very good with numbers. I, I’m sure she is. I’m sure she’s helped you with some of your financial issues that we’ve seen some of the financial issues that we’ve seen with the Trump Organization. I’m sure that part of the reason why you don’t want us to see your tax returns, because maybe Ivanka is really good at numbers, but as far as her role in the White House today, most people, including former and current members of your administration, have no idea why she is even there. Those stories have been coming out since the first two months of you being the president. Nobody knows what she does. Nobody knows why she’s there. Everybody knows that she doesn’t know what she’s doing and most of them actually want her gone. Hey, that actually includes you, bud. Remember this like two weeks ago when all those stories came out that you actually wanted a John Kelly to fire your own daughter because she was just making life miserable for you up there by constantly screwing up along with Jared Cushner because you didn’t have the guts to fire her yourself and now you’re going to come out here in this Atlantic interview and say, Oh yeah, vodka be great. She’d be almost impossible to beat. No, no. That’s not how it works. We know how you feel about her. We know how you romantically feel about her and it creeps us the hell out. But you also, when it comes down to actually doing a job, have told people in private that she’s an idiot. So which Trump should we believe? Should we believe the one who’s talking in private or should we believe the one doing this great interview in the Atlantic about how great Ivanka would be and how no Democrat could ever beat her? Here’s the thing, I’m pretty sure any one of my, uh, children who are all in elementary school would be able to beat Ivanka. They could beat her in a debate. Uh, they could beat her in coloring. They could probably even beat her in numbers. Donald, because your daughter’s never really had to work a day in her life. Your daughter’s never had to excel at anything. Your daughter’s never had to try. And yet she keeps failing upwards because of you and just like you. Same thing with all your other kids. Maybe Barron’s a little different. Hopefully. Hopefully he doesn’t have those Trump genes that make them just a horrible human being. But we know that Ivanka, Eric, and Don Jr have that gene. Ivanka Trump, if she were to run for president, would be a very beatable person. 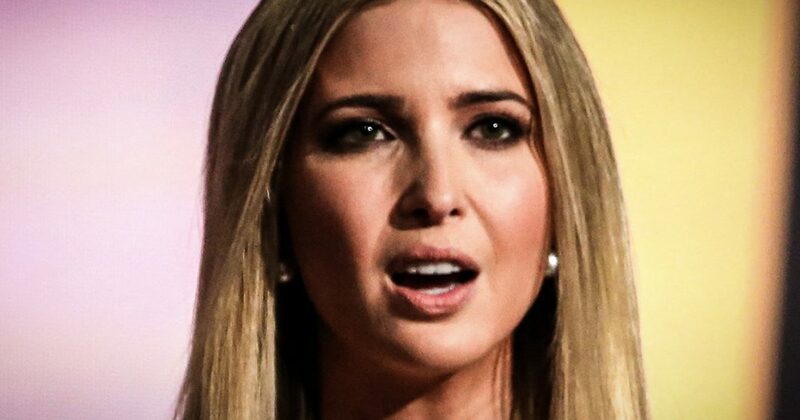 Honestly, I think any Democrat would be able to be a beat Ivanka because even though she’s just as horrible as her dad, she doesn’t have the ability to drum up that anger and the hate filled base like Donald did. So Ivanka would struggle with that. But you know who could do it unfortunately is Donald Jr who as we have discussed plenty of times, has not ruled out a future run for president. These are people who have accomplished nothing in their lives other than living off their father’s name, who was also living off his father’s name. They don’t deserve to be president of the United States. They are not qualified to be president of the United States. They would be a real threat to this country if any of them were to ascend to the presidency. We’ve only had two years of their dad and we’ve seen how bad things can get when you have a no nothing sitting in that office. Now just imagine how awful it would be if after Trump we then get don jr and then after him we get Ivanka. Who knows? At that point, maybe they will have polished Eric enough so that he could run for president after brother and sister leave office. Trump wants to create a political dynasty here in the United States. Unfortunately for him, it’s a dynasty built on hate, a dynasty built on zero accomplishments and entire dynasty that was built by conning enough people in this country to vote for you, even though you are grossly on qualified to hold this position, and he thinks his kids might have enough of a con man in them to do the same thing.